The Wates Cemetery is located in the far western end of Lauderdale County at the Tennessee River. To reach the cemetery from Waterloo, Alabama, travel Co. Rd. 103 (Pea Ridge Rd.) from Main St. in Waterloo for approximately 8 miles. Turn left onto Stateline Rd. and travel 5.5 miles, turning left. Travel for 1.3 miles and the cemetery is on the left of the road. 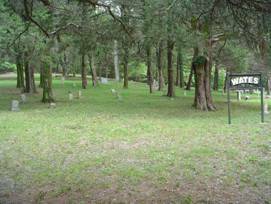 This is a very old cemetery with numerous unmarked graves. The oldest birth date known is that of Robert T. Shaw, being born in 1813. In years past, it has been known as the Shaw-Wates Cemetery. The sign has only the Wates name. There were no Wates graves found, although, some of the unmarked graves could carry that name. Burrows, Mary E.; b. 01 Sep 1882, d. 06 Dec 1882, daughter of W.H. & N.M.
Burrows, Nellie; b. 10 Feb 1840, d. 22 May 1908, wife of S.F. Carson, Lillian A.; b. 02 Mar 1881, d. 17 Mar 1913, daughter of Jobe & Mary E.
Higgins, Nancy M.; b. 02 Apr 1859, d. 26 Jul 1894, wife of J.M. Mangum, Cornie; b. 29 Oct 1857, d. 02 Dec 1889, wife of J.E. Mangum, Margret A.; b. 17 Feb 1838, d. 02 Feb 1923, wife of M.R. Mangum, Marion Atwell; b. 23 Dec 1900, d. 18 Dec 1901, son of J.M. & M.J.
Mangum, Mary Cornelia; b. 25 Oct 1910, d. 02 Nov 1910, daughter of J.M. & M.J.
Mangum, Mary J.; b. 05 Oct 1875, d. 15 Jun 1914, wife of J.M. McClain, Bunavesta; b. 26 Feb 1876, d. 03 Jul 1888, daughter of N. & N.A. McClain, William Nelson; b. 05 Aug 1867, d. 25 Jul 1871, son of N. & N.A. McKelvey, Mattie M.; b. 07 Mar 1858, d. 20 Dec 1940, wife of A.T.
McKelvey, Muray W.; b. 21 Dec 1918, d. 22 Apr 1920, son of J.A. & M.E. McKelvey, Sarah T.; b. 02 Oct 1819, d. 08 Nov 1897, wife of John N.
Phillips, Christine V.; b. 06 Nov 1904, d. 24 Aug 1908, daughter of Charles D. & Ora B.
Qualls, Nora Effie; b. 20 Mar 1895, d. 10 Nov 1918, wife of Lancer T.
Richardson, Gracie Mae; b. 12 Jan 1919, d. 17 Apr 1919, daughter of John C. & Bessie C.
Scott, Ida A.; b. 14 Oct 1872, d. 28 Feb 1916, wife of J.M. Shaw, infant; b. 02 Oct 1867, d. 02 Oct 1867, daughter of T.B. & L.A.
Shaw, Jesse B.; b. 20 Nov 1874, d. 21 Oct 1875, son of Houston M. & N.A. Shaw, Nancy J.; b. 31 Jul 1871, d. 22 Aug 1876, daughter of T.B. & L.A.
Shaw, Orea Anner; b. 27 May 1872, d. 06 Sep 1873, daughter of Houston M. & N.A. Shaw, Robert Lee; b. 1871, d. 1943, brother of Allen W.
Smith, Lular (Cherry); b. 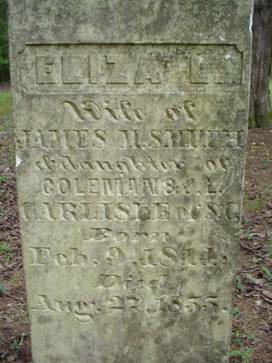 24 Dec 1880, d. 07 Jan 1962, wife of Dave Sr.
Smith, Ulah; b. 01 Apr 1883, d. 07 Oct 1941, wife of E.N. Tacker, Elizabeth; b. 30 Jun 1861, d. 17 Dec 1927, wife of Thomas W.